Everyone who does Hip Hop RnB, or Dance style tracks need a great 606 sound to get their drums pumping to the beat. D16′s Nithonat is exactly what you need. On ‘Drum Month’ promo at over 30% off right now. 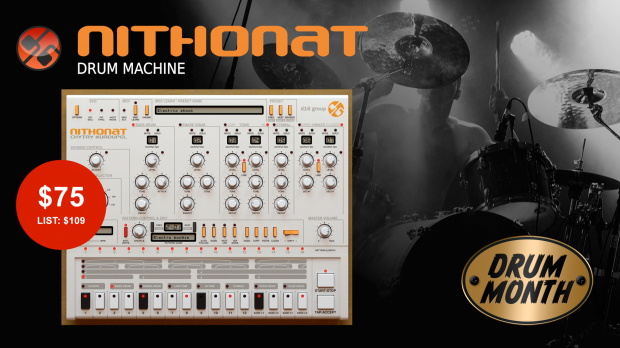 Nithonat is a fully synthesized drum machine based on the classic 606. Its unique sound has snuck its way over the years into productions spanning Electro, Hip-Hop, R n’ B and Pop. D16 re-created a legend with virtual perfection, and then expanded on it with essential features, exclusive to Nithonat. A whole spectrum of sounds is now at you fingertips – rumbling kicks, barky snares and completely unique, ear-grabbing toms and hi-hats. For the first time since its release in the 80s, you can explore what the 606 would have truly been capable of! This entry was posted in DontCrack, Promotions, Virtual Instruments and tagged 606 drum emulation, 606 drum machine, D16, Electro, Hip-Hop, Nithonat, R n’ B. Bookmark the permalink.